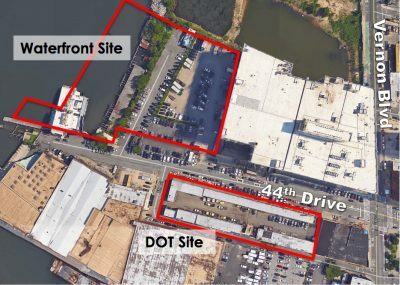 The assemblywoman’s opposition to the plan follows a September 2017 letter she sent to the mayor, where she called the EDC’s plans “problematic”. Both Van Bramer and Nolan plan to join the community next month in a rally to express their opposition to the EDC’s plan. 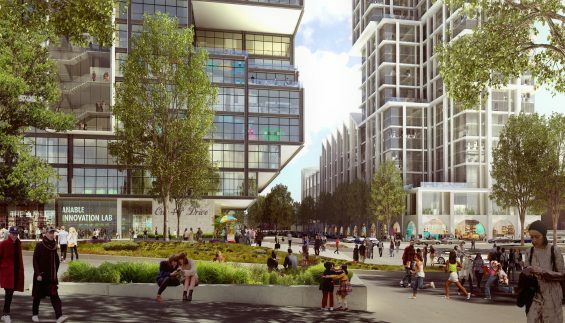 The LIC Coalition’s vision for 44th Drive. The rally, organized by the LIC Coalition, a grassroots group formed nearly two years ago, is an extension of frustrations raised by the community since the EDC’s controversial plans were detailed last summer—that the city should not be using scarce, publicly-owned land to build luxury waterfront towers in a neighborhood overwrought with development. 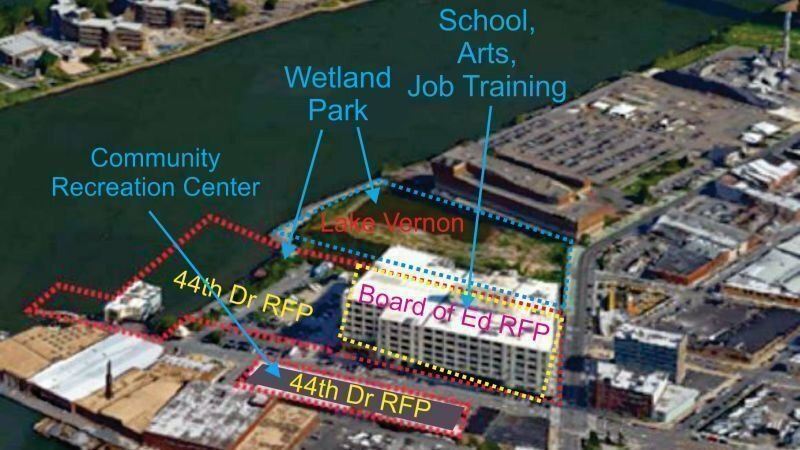 The March 3 event, aptly titled “This Land Is Our Land”, will see residents, civic groups, and local leaders call for long-demanded public goods, like open space that would enhance the waterfront’s resiliency, job training centers, and space for the arts at the site. Their demands are written out in an updated petition by the group, first released in August. A recreation center, as outlined in a new petition created several weeks ago, is also on the list. And given the overcrowding issues currently plaguing PS 78 just a few blocks down, a school, to be built immediately, is also on the table. Diane Hendry, a member of the LIC Coalition and a 30-year resident of the community, said the rally is a chance to “scream from the rooftops” and demand that the city engage in comprehensive community planning. The EDC told the LIC Post that their project will deliver many goods and features to the community. The rally is planned for midday on March 3 at 44th Drive and Vernon Boulevard. The LIC Coalition is still working to finalize the lineup of guests and speakers at the event. Notice those two gaping holes in the earth next to the Board Of Ed building? That’s where the FILA tennis courts used to be before a “developer” bought them and started building two massive buildings and caused the land to cave into the river. I doubt anyone who now lives in the area actually did the historical research before they bought here. The entire area is a BROWNFIELD of toxic landfill. Go ahead and build something there with your tax breaks. We’ll see how far you get. Government set pricing is not a new idea. It’s called socialism and it doesn’t work. If you don’t believe that, google USSR. This city is a major financial hub and will continue to appreciate in price. If you want to lock in a price, save some money and then buy something. Then when the neighborhood triples in price you can sell your place and be a millionaire in Tallahassee. Let me see you complain of rising prices after that happens. There is very little room for dumb in NYC and if you feel yourself getting pushed around, you might be suffering from some dumb. Get some smart friends and let them help you. “Voice,” above, betrays his/her Russian bot origin. Retire to “Tallahassee” is a dead giveaway. Sowing dissension, indeed. Wait a minute, they are saying massive residential buildings were actually rejected?! You mean there is still HOPE for our area!!??? I will stuff a tooth under my pillow tonight!! Park/pool/water park would all be welcome additions…but a lighthouse? For what exactly? Somehow reasoning won out on this terrible idea, very strange for GREEDY DEVELOPERS & he City to give up. (See WIllets PT) . How about a Park/Community center which is badly needed. The park could shield against future Super Storms Flooding with a wetland area. Yes I’m surprised that GREEDY DEVELOPERS like Trump actually did something moral. We need to bring back the charm of Astoria/LIC. We are not mini Manhattan. Fix the danged streets that are being torn up. Add some more public parking that you’ve eliminated or caused to be in short supply due to overbuilding and not requiring parking in new structures. Thanks for standing up to all this ugly overbuilding! Yeah! More parking lots! That will bring back the “charm” of LIC! We should focus our money on the 10% of the population that wants to drive in a congested city. LIC has much more than enough 4the very rich. I grew up in that Neighborhood & been forced out 2x . The other boro’s I don’t consider my home . The hills + stairs of the Bronx is where I’m constantly being sent! This city would rather make my physicle Disablities worse + more expensive 2treat than help me get Housing in LIC or Astoria! They r constantly telling me “Rents r Cheaper in the Bronx! Year they refuse 2see everything else is more expensive in the Bronx ! Everyone that’s become homeless 4the rich 2get richer should b given the ability 2return home! All the excuses is 2force people 2 b worse off than they were B4! What is this community center? Not really sure who is calling for that. We have amazing parks and (almost, eventually, if they can get those expensive European windows on) a brand new library. We have a tennis facility and the YMCA. Personally, not sure why someone thinks a community center on waterfront property is the best use of this land. I wish LIC hunters point had a huge public pool for summer ! The YMCA and tennis center are both 1.5 miles from the waterfront area. Hardly convenient for the many people living in the Hunters Point area. The second “plan” would invade the New York City Dept. of Education facilities management building–the large white building purple lettered for “student training,” for housing–it’s on the waterfront. Just north, that “lake” was deliberately left there after the last hurricane, in an attempt to destroy the foundation of the DOE building and infest Queens with mosquitoes. The “pond” was once a tennis court/pool area, circa 2000. The owners apparently want to build luxury housing on the “lake” and DOE building. There is an unsafe fence that’s been left fronting Vernon for many years, without a peep from the City. The purported designation of “wetlands” is a sick joke., as an effort to drain an fill the mosquitoes and safety hazard should be attempted immediately. The area designated Board of Ed RFP is a City property. The clever idea of a wetland park is in fact a sick joke–the wetlands were the result of the last hurricane, and invade the DOE building. As City property, merely underutilizing it with the new label, would invite the wrecking ball–the City sold so much property to Bloomberg’s friends in real estate, it is a miracle of survival, holding hundreds of workers and valued property in a prime area for distribution of supplies. That’s the building’s job. The scummy pond next to it abuts the foundation–as seen in the first photo, top. There is a shaky fence on Vernon, with large gaps, so that between the mosquitoes and dangerous gaps, children can drown and lots of us get bitten. Welcome to NY real estate. Who else guessed that the land grab would go north? In NYC, couples that both work and squeeze their 3 or 4 person families into 1 or 2 bedroom rentals are not rich. Comfortable middle class maybe, but not rich. It is thoughtless and pointless to just be angry at people that have more than you. I don’t think the other poster was calling a middle-class family “rich.” More affordable housing could help BOTH low-income families and the middle class! brooklynmc, you just don’t get it. Mostly “RICH” people can afford $2,540 for a studio or $3,200 for a 1 bedroom or, $4,200 for a 2 bedroom. This is not “MIDDLE CLASS”. people just want to be able to live here. The Real Estate Developers don’t give them much of a chance. It is not just about despising the rich , it is they are given pfeferential treatment that people don’t like. Everything is “LUXURY” or “HIGH END”. Average people don’t like this. Wake up and smell the coffee.